Last week had two major tournaments. One was arguably the Kansas’ most prestigious wrestling competition, the 56th Newton Tournament of Champions. The second one is the Bobcat Classic at Basehor-Linwood. Bonner Springs easily won the 30-team tournament with 232 points, well ahead of second-place Aquinas at 167.5. At Newton, Goddard won the 30-squad competition with 216 points, followed by Arkansas City at 193.5 and Maize at 179.5. Those teams continue to be ranked 1-2-3 respectively in Class 5A. Next, Manhattan was fourth at 155, Derby took fifth at 147.5 and Washburn Rural finished sixth at 146.5. In the 6A ploll, Derby is first, Manhattan second and Washburn Rural third. Blue Valley Southwest, ranked fourth in 5A, took seventh with 123.5 points. McPherson, still unranked in the top-10 in 5A, enioyed an eighth-place showing with 112 points. Host Newton and Wichita Northwest tied for No. 10 with 101 points. Dodge City, fourth in 6A, took 12th with 91 points. Newton is eighth in Class 5A. Among the 3-2-1A ranks, Eureka finished 14th with 79 points and Norton was No. 20 with 59.5 points Norton continues to stand second in 3-2-1A, and Eureka is third. The Lions finished with 18 pins, tied for second with Manhattan. Washburn Rural had one more. At 113 pounds, Jason Henschel, ranked No. 1 in 5A, earned the championship with a dominant run against multiple highly ranked wrestlers. After a first-round bye, he earned a win by fall in 1 minute, 42 seconds. In the quarterfinals, he pinned Arkansas’ Sammy Dickey in 70 seconds. Dickey is ranked sixth in 5A at 113. In the semifinals, he beat Manhattan’s Easton Taylor, 12-2. Taylor is ranked fourth in Class 6A. In the championship, Henschel pinned Eureka’s Kendall Beitz in 3:08. Beitz (26-1) remains top-ranked at 3-2-1A. Henschel is 20-3 this year. Henschel finished with 31 team points, which tied for fourth among all wrestlers and paced the Lions. At 120 pounds, Goddard sophomore Lucas Glover, ranked third in 5A, took third. At 126, freshman Jerrdon Fisher, ranked No. 1 in Class 5A, moved to 18-5 with a championship. Entering the competition, Fisher was ranked third in 5A. He was not among the top-eight wrestlers to receive a first-round bye, but emerged with the title. Like Henschel, Fisher rolled through his bracket with five wins: 17-3, a fall in 1:50, a 9-1 win and victories by 11-3 and 7-1 scores. Fisher tied for seventh among all wrestlers and was second for the Lions with 29 team points. In the quarterfinals, he defeated Emporia’s Levi Buckridge, ranked No. 4 at 126 in 5A. In the semifinals, he dispatched Leavenworth’s Hartwell Taylor, ranked No. 3 at 126 in 6A. In the finals, he defeated Blue Valley Southwest’s Joseph Dennison, ranked No. 2 in 5A. At 138, Blue Valley Southwest’s Brandon Madden, now currently ranked No. 1 in 5A, defeated Goddard’s Jace Fisher, now ranked second in 5A, with a 6-3 decision. Madden is 22-3, and Fisher is 9-4. Cayleb Atkins (15-3) took third at 145. The sophomore is ranked fifth at 145 in 5A. Nolan Craine, ranked third at 5A, also took third at 152 and moved to 20-6. At 160, junior Trevor Dopps (18-5) was third. Dopps is ranked first in 5A at 160. Cayden Atkins (15-8) was fourth at 182. He is ranked third at the classification. 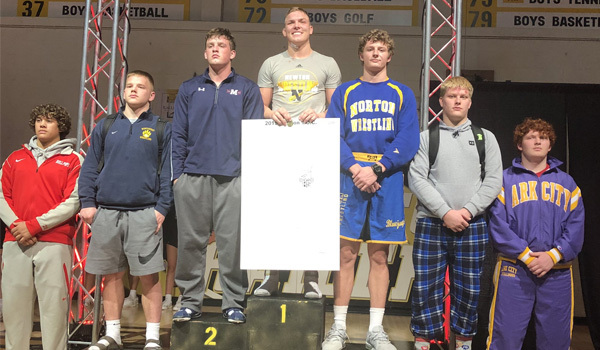 At 220, Trenton Willert (16-7) finished fifth. He is ranked fourth. At 106, freshman Jevin Foust, ranked No. 1 in Class 5A, took fourth and is 22-9. At 120, Kael Pappan (22-8) defeated a loaded field and moved to No. 1 in Class 5A. In the championship, he defeated Newton’s Grant Treaster, 3-1. Treaster is 16-2. Last week, Treaster was No. 1 and Pappan was third. The 132 class had a 1/2 matchup between Maize’s Aidan Campbell and Ark City’s Gabe Buckbee, both seniors. Campbell, the top-ranked wrestler, moved to 22-1 and won in a 2-1 tiebreaker. Buckbee is 12-3 and ranked second. At 145, Christian Robinson (22-11) is unranked and took fourth. The 152 finals featured one of the higher profile matchups between Ark City’s Montez Robinson and Derby’s Crew Squires. Robinson is No. 1 in 5A and 24-5, and Squires is 13-2 and ranked first in 6A. Robinson won 3-1. At 195, Deston Miller (13-8), who is unranked, finished fourth with a 7-6 sudden victory win against Manhattan’s Robert Houston, who is fourth at 195 pounds in 6A. Houston moved to 18-6. Sophomore Kyle Haas, ranked No. 1 at 182 pounds in 5A, led the Eagles with 30 points, sixth-most among all wrestlers. Maize showcased delivered elite talent with three titlists. Haas (22-0) had a bye and then had won his first two matches by falls in a combined 46 seconds. In the semifinals, Haas beat Derby’s Triston Wills, by fall in 1:54. Wills is ranked No. 1 in Class 6A. Wills has committed to Oklahoma State. In the final, Haas had an incredible match against Winfield’s Owen Braungardt. The senior is ranked No. 1 at 182. Haas won 4-2 by sudden victory and dropped Braungardt to 21-3. Last week, Wills defeated Braungardt at the Derby tournament. At 113, Junior Camacho (19-5), who is ranked second behind Henschel, earned third. After a bye, he won his first two matches by fall and then lost to Eureka’s Kendall Beitz, 4-3. On the backside, he defeated Winfield’s Braden Ledford, 1-0, and earned an overtime 4-2 win in a key 5A matchup with Blue Valley Southwest’s Brett Umentum. Ledford is second in 4A, and Umentum stands third in 5A. Campbell (22-1) collected his title at 132. He finished 4-0 with a 2-0 victory against Olathe East’s Dallas Koelzer in the semifinals. Koelzer, a junior, stands third in 6A. At 145, junior Devin Gomez (25-0) stayed No. 1 in 5A with a crown. He went 5-0, including wins by 13-4, 14-5, 9-3 and 9-6 scores in his last four matches. At 285, Jake Quiggle (20-5) has quietly enjoyed a nice season was unranked until this week when he came in at No. 5. He took fourth last week. Quiggle, in the consolation semifinals, defeated Washburn Rural’s David Huckstep, 10-2. Huckstep is 23-5. In the third place match, Valley Center’s Tony Caldwell, ranked No. 2 in 5A at 21-3, beat Quiggle by fall. In the lower weights, Manhattan earned a fifth place at 113 from Easton Taylor and sixth by Tate Sauder at 120. They are both ranked fourth in 6A. At 152, Daron Island-Jones, was unranked in 6A, took fourth and moved to 14-4. Island-Jones moved into the rankings to fourth this week. Another huge matchup came at 160 when Manhattan senior Bubba Wilson, ranked No. 1 at 160 in 6A, defeated McPherson’s Scott Radke, ranked No. 2 in 5A. Wilson delivered a 5-1 victory and moved to 23-1. Radke dropped to 23-1. At 170, Quincy Saddler took sixth and Robert Houston earned fourth at 195. Saddler was unranked last week and is now third. Houston moved up a spot from fifth to fourth in the poll. At 220, senior Christian Schlepp, who is ranked second, moved to 20-4 and took second. Schlepp was seeded second. Schlepp had an impressive run through the tournament. After a bye, he defeated Olathe South’s Alec Younggren by fall in 3:55. Then, in the quarterfinals, he pinned Goddard’s Trenton Willert in four minutes. In the semifinals, he pinned Wichita Northwest’s Josh Carter in 4:19. Younggren is sixth in 6A, Willert is fourth in 5A and Carter is fifth in 5A. In the finals, though, he lost by fall in 2:39 to Newton’s Wyatt Hendrickson, who is ranked No. 1 in 5A at 220. Weight class 220 in 5A has two dominant wrestlers in Newton’s Hendrickson and St. James junior Cade Lautt. Nationally ranked Hendrickson (23-0) dominated again in his home tournament. After a first round bye, he won his two matches in 23 seconds and 1:08. In the semifinals, he gave Norton’s Hayden Wiltfong his first loss of the year by fall in 3:20. Wiltfong is ranked second in 3-2-1A at 220. Wiltfong and Hendrickson dominated their competition. They were two of six wrestlers to lead the tournament with four pins. Wiltfong had the fastest collective pin time at 4 minutes, 11 seconds. Hendrickson was second at 7:30. Derby senior Cade Lindsey, ranked No. 1 at 170, was the top point scorer for all classes with 33 points and led the Panthers. Lindsey (23-1) went 5-0 and won his first four matches by fall in 4:36, 1:29, 1:36 and 4:00. In the final, he defeated Bishop Carroll’s Ryan Murphy, 9-1, in the championship. Murphy is ranked second in 5A. In addition, Cason Lindsey (18-7) took third at 132. The sophomore is ranked second at 132. In addition to Squires’ second-place showing and Triston Wills’ third-place finish, Taidon Wills took seventh. Bryce Westmoreland (17-6) finished fifth at 195, and Ronnie Washington (19-6) was seventh at 285. Sophomore Bishop Murray (23-0) remained perfect and No. 1 ranked in Class 6A with a title at 106 pounds. After a first-round bye, Murray won 19-5, 8-2 and 12-3. In the championship, Murray defeated Dodge City’s Damian Mendez, 5-1. Mendez is 25-5 and is ranked second at 106 in 6A. Freshman Austin Fager, is ranked second at 145, and moved to 21-4 with a fifth-place showing. Junior Gavin Carter is ranked second to Triston Wills at 182 pounds in 6A and took second. At 195, Preston Williams (17-1) is ranked first in 6A and won three matches by fall in 3:36 or less. In the championship, Williams defeated Carroll’s Brady Bockover, 18-10, in the final. Bockover is 21-2. David Huckstep, ranked third in 6A, took sixth. McPherson senior Mya Kretzer continued her acclaimed career with another fine showing at the TOC. It’s believed that Kretzer is the first female to compete at the Newton TOC. She has done it twice, advanced to the second day both times and has a 4-4 record in the tournament. At 120 pounds, Kretzer is 10-9 this year. She won her first match, 4-2, and then lost by fall in 1:22. On the backside, she delivered a 7-4 victory and then lost, 3-2. Also for the Bullpups, McPherson’s Rhett Edmonson took third at 138 and stands at 23-1. He suffered his only loss to Goddard sophomore Jace Fisher, 4-2, in the quarterfinals. The 285-pound championship match pitted Wichita Northwest’s Marcus Hicks against Dodge City’s Evan Darville. Hicks is ranked first in 5A, while Darville is first in 6A. Hicks, an Oklahoma football commit, moved to 15-1 with a 5-3 victory. Darville, who has received significant interest from colleges, took his first loss and dropped to 22-1. Sophomore Derek Duffett (18-6) is ranked third in 5A and took third at 106. At 113, Cassius Vanderpool (19-5) won the title and moved to 19-5. Vanderpool is unranked in 5A. In the championship, Vanderpool defeated Lawrence’s Logan Farrell, 7-0. Farrell is ranked sixth in 6A. The Greenbacks, ranked eighth in 4A, won the nine-team Clearwater tournament with 192 points, 40 ahead of runner-up Mulvane. At 106, Pratt sophomore Devon Weber (24-0) and won his first four matches by fall with wins in 63, 50, 18 and 19 seconds. In the championship, Weber defeated Nickerson’s Nichole Moore, 11-2, in the finals. Moore is 20-6 and, like Kretzer, is a nationally ranked wrestler and continues a superb season wrestling season against the boys. At 152, Kadence Riner (23-1) captured the title. Riner is ranked second in 4A. Riner had a bye, a technical fall victory and three wins by fall in under one minute. Bryce Winsor (5-0) had his first five matches of the winter and earned wins by scores of 6-0, 7-4, 4-3, by technical fall and by fall in 2:30. Caden Blankenship (19-5) won the crown at 182 pounds. Moore had a dominant run through the tournament before the finals. She won by fall in 3:25, 3:59, 1:35 and 1:50. In addition to her second-place showing, Gage Cooper (22-4) took second at 113 for Nickerson.